Long Beach, Calif. – December 8, 2010 – Just in time for the holidays Formula DRIFT has announced the release of limited edition headwear designed by Formua DRIFT champions with Flat Fitty. Past champions Samuel Hubinette, Rhys Millen, Tanner Foust, Chris Forsberg, and current Formula DRIFT champion Vaughn Gittin Jr. have all designed their own hats that represent their personalities. The hats are now available to purchase online on the Formula DRIFT website. Posted in Featured, Press Releases | Tagged Chris Forsberg, Flat Fitty, Formula D, Hats, Limited Edition, Rhys Millen, Samuel Hubinette, Tanner Foust, Vaughn Gittin Jr.
Long Beach, Calif. – November 18, 2010 – Formula DRIFT Holdings, LLC; operators of the Formula DRIFT Championship and Abu Dhabi Motorsports Management; operators of the Yas Marina Circuit have announced a deal to bring the Inaugural Formula DRIFT UAE Invitational Competition to Abu Dhabi, United Arab Emirates on February 25, 2011. Eight of the top drivers and cars from Formula DRIFT, will showcase world class drifting in competition format to the Persian Gulf region. The 8 drivers include 2-time Formula DRIFT champion and 3-time X-Games Gold Medalist Tanner Foust, 2010 Formula DRIFT rookie of the year and past Scandinavian champion, Fredric Aasbo, 2009 Formula DRIFT champion, Chris Forsberg, Darren McNamara, Ryan Tuerck, and Daijiro Yoshihara. The final two drivers will be announced at a later date. Long Beach, Calif. – October 10, 2010 – Formula DRIFT entered the final event of the 2010 season at the Toyota Speedway at Irwindale for Round 7: Title Fight. Tanner Foust in the Rockstar Energy Scion Racing TC takes the event victory and becomes the Tires.com Triple Crown winner, while Vaughn Gittin, Jr. in the Monster Energy / Falken Ford Mustang is crowned the 2010 Formula DRIFT champion. The Toyota Speedway at Irwindale hosted the finale event to a sold out crowd. The action was non-stop all weekend featuring the Formula DRIFT ProAM championship, Fatlace One of One Showcase car show, and the Formula DRIFT championship. In addition this was the first drifting event to be filmed in 3D by DirecTV with an air-date to be announced. The event was also featured live online via the DriftStream to a global audience. The finale event did not fail to disappoint showcasing intense drifting action to determine a new champion. The battle for third place pitted Darren McNamara in the Falken Tire Saturn Sky against Michihiro Takatori in the BF Goodrich Nissan S15. McNamara pushed his car too hard hitting the wall taking himself out of the competition giving Takatori third place. The finale battle put 2-time Formula DRIFT champion Tanner Foust against Vaughn Gittin, Jr. After a close One More Time battle, Foust edged out Gittin to take the event victory and also secure his first Tires.com Triple Crown bonus prize. 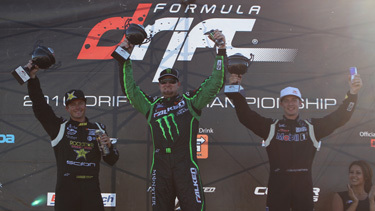 With his advancement into the Top 16, Vaughn Gittin, Jr. secured the 2010 Formula DRIFT championship. Gittin found the podium 6 out of the 7 events through the season on his way to his first championship. Long Beach, Calif. – Oct. 5, 2010 – Drift fans will want to buckle up for the DIRECTV broadcast of the world’s first drifting event in 3D. Produced by Formula DRIFT and DIRECTV, the program will focus on a series of battles from Formula DRIFT’s “Round 7, Title Fight” and will be aired exclusively on DIRECTV’s 3D channel, n3D™, Powered by Panasonic, later this year. DIRECTV’s exclusive 3D channel ,n3D™ powered by Panasonic, is available at no additional cost to millions of DIRECTV HD customers. In addition to the 2010 MLB All-Star Game, the NASCAR Coke Zero 400, and ESPN’s 3D coverage of the Summer X Games 16, n3D customers also have access to exclusive, original 3D programming such as “Guitar Center Sessions” with Peter Gabriel and Jane’s Addiction. 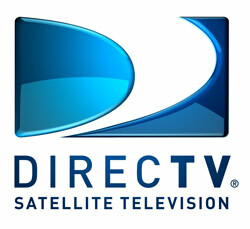 DIRECTV HD customers received a free software upgrade that enables them to have access to the 3D channels on DIRECTV. DIRECTV HD customers will need a 3D television set and 3D glasses to view 3D programming on DIRECTV. Long Beach, Calif. – September 11, 2010 – Formula DRIFT entered Sonoma, CA for Round 6: Point of Impact with Vaughn Gittin, Jr. taking his second victory of the season and increasing his points lead heading into the last round of the season on October 8-9 at the Toyota Speedway at Irwindale. The competition was fierce and made for another exciting event with the drivers putting it all on the line before heading into the Finals. The Top 4 competition consisted of a battle between current champion Chris Forsberg in his NOS Energy Drink Nissan 350Z against 2-time Formula DRIFT champion Tanner Foust in his Rockstar Energy Scion TC for third place. 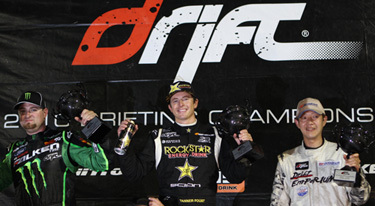 Foust took the victory and maintained his third place status overall in the point standings. The final match-up pitted Vaughn Gittin Jr. in his Monster Energy / Falken Tire Ford Mustang against Ryan Tuerck in the Mobil 1 / Maxxis Pontiac Solstice. Gittin edged out Tuerck for his second victory of the season increasing his lead overall in the championship standings with only 1 event remaining in the season.